Well, I really don’t know what I’m going to use to make myself feel better now, since the moment I saw Sideshow’s solicits for their Premium Format Ms Marvel figure, I knew I was sunk, because I’ve had a love affair going with this character for a very, very long time, and this piece just captures her perfectly. I first came across Carol Danvers in the pages of Uncanny X-Men, when she had just started going by the codename Binary after losing her original Ms Marvel powers to Rogue. My interest in finding out about her history was in part responsible for my discovering and falling in love with The Avengers. When I cam back to comics after my long hiatus, Carol being in her Ms Marvel uniform again was a familiar sight amongst all of the changes that had taken place. Ms Marvel’s most recent solo run was a wonderful read for many issues, before being derailed by too many tie-in issues for Secret Invasion and Dark Reign, and I still miss it sadly. 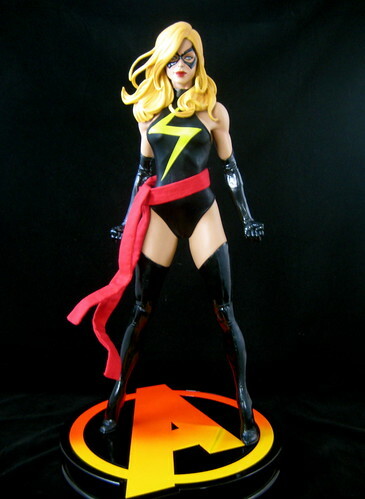 What better way to make me feel better than to have a ¼ scale Ms Marvel adorning my display cabinets! I didn’t bother with the Sideshow Exclusive version of this figure, which had a swap-out head, as the regular version was the head I wanted to display her with, and for some reason it’s generally cheaper to buy Sideshow’s products from other e-tailers than from Sideshow itself. I just have to start off discussing this figure by saying that there is absolutely nothing I would change about it. It’s just about as perfect as perfect can be. The headsculpt is just gorgeous and beautifully painted – a great start to the figure. 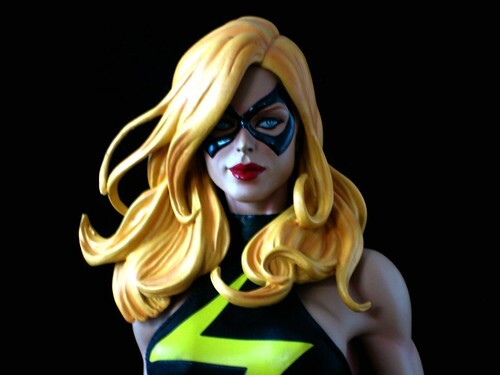 This version has the visible eyes which is the version of Ms Marvel I like best, and they are very nicely detailed. Her hair is sculpted with a great deal of detail. I like the pose that has been chosen for this piece. It’s very strong but natural. It also allows for simple assembly – the statue element of the piece comes fully assembled except for her head, which must be attached. The also makes for a box which isn’t actually as big as I thought it might be, which means it won’t be too hard to store. One of the features of the Premium Format figures is cloth costumes, and the detail that’s been put into the gear for this piece is pretty awe-inspiring. Her gloves and boots are vinyl, her outfit is a durable fabric and her sash comes separately. It has a metal wire running through the edges of it so that you can arrange it to get a flowing effect. One thing I was concerned about in entering into my first piece in this style is how the fabric pieces would wear, but seeing it in person has put that rest. Obviously I need to avoid dust, but if that’s done I am confident that the piece will have a long life. The only “wardrobe malfunction” Ms Marvel is in any real danger of is her costume riding up her… ahem…. at the back. As Mrs AFB Commented, you’d want to be pretty invulnerable with a skimpy outfit like that! The figure comes on an Avengers-themed base, with the classic “A” giving it shape. It’s quite a large base, just a tad too wide to fit into my Billy bookshelves, so I have it housed in a Detolf at the moment (requiring the removal of a shelf) while I consider more permanent options. As with so many different types of collectibles, now that I’ve had one bit of the Premium Format apple, I can’t stop there. So far I have ordered the Exclusive versions of She-Hulk and Rogue, and my mouse has been hovering over a good price on the regular version of Bucky Barnes as Captain America several times now. There are quite big pieces, so it’s not the kind of thing you can collect willy-nilly, but now that I’ve seen how nicely Ms Marvel fits into the display, it’s easy to visualise how others would compliment it. Sigh. Well, at least I don’t collect 1:2 scale figures! I mean, those people are REALLY crazy…. That's a very nice statue indeed. I like the little detail of the bendy-wire cloth sash. Nice to see that someone finally nailed a good representation of the character. Any word on the cost? She is indeed a beauty. What's that you say, the uniform is removable? I agree, this is a gorgeous piece. Unfortunately, I still am not one of those people that collect Sideshow Premium Format figures, because they're too large and much too expensive for me. If I did collect the pfs though, this is one of the first I would buy, along with Mystique. Love it. My only problem would be not buying two so I could use one to customise into Adam Warren's Empowered (I've always thought the two looked similar enough it'd be a simple custom).